Two renewable resources that will never run out! Wind turbine blades are driven by the kinetic energy of wind movement which in turn drive a generator (electrical energy). Energy from the wind's kinetic energy store is mechanically transferred to the kinetic energy store of the turbine blades and the rotor of the generator. The kinetic energy is converted to electrical energy by the magnetic field of the generator. Each set of turbine blades is connected to a generator to produce electricity which can be fed into a domestic supply or, more likely, fed into the National Grid system. 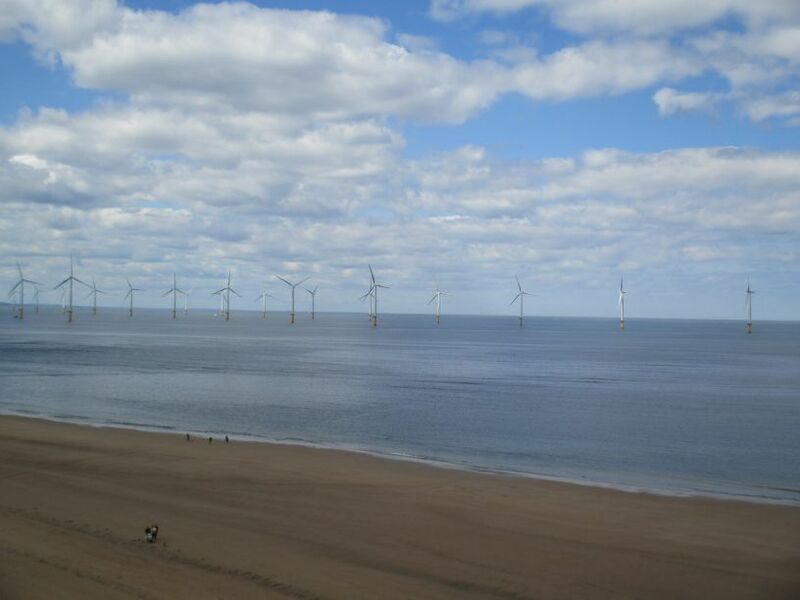 They are sited in clusters ('wind farms') in exposed locations on open land or out at sea (the latter is a more expensive location to erect the turbines). Locations are chosen after a survey is done to see if a commercial amount of wind blows! Wind turbine technology isn't cheap at the moment, BUT, as more are built and designs improve, they are becoming more commercially more viable and the energy is free and maintenance costs are low. Free source of energy, however unreliable, this kinetic energy store resource will never run out. There is no pollution, though some people feel they spoil the view of the landscape. Costly to build, but relatively cheap to maintain in good running order. There is no lasting damage to the landscape - they can be easily removed if need be. The initial capital costs are high, BUT the running costs are low. It takes a great many wind turbines to generate the same amount of electricity as a large scale power station such as those run on nuclear of fossil fuels. Wind power generation is not capable of dealing with the high energy demands of peak times eg peak travel/cooking time because, unfortunately, you cannot suddenly increase power production at all - unless the wind suddenly increases in speed! Some people object to what they see as 'visual pollution' or 'noise pollution' but at one time hundreds of windmills were a common sight in the countryside. There are several other problems too eg wind speed is variable and if it drops to zero, so does the power generation. The turbines may have to be stopped if the wind speed is too high. Wind turbines cannot, at the moment, cope with high electricity demands e.g. peak times in the day. Know and understand that 'renewable' electricity can be produced directly from the Sun’s radiation. The nuclear energy store of the Sun is converted into several forms of energy. One form is the whole range of electromagnetic range. Solar photocells can be used to capture visible light and convert it directly into electrical energy. You should know that solar cells can be used to generate electricity and should be able to describe the advantages and disadvantages of their use. Solar cells (photovoltaic cells) produce 'small scale' electricity direct from sunlight energy. Solar cells are fabricated from materials that respond light energy and promote the flow of electrons i.e. they created a potential difference causing an electrical current to flow. You can use them to power remote devices from telephones to weather recording instruments, where it is too costly to lay on mains electricity. Calculators and watches are easily powered by a solar cell as are electric road signs. However, all of these examples a very small scale uses of solar powered electricity sources. Note: You can also use the infrared radiation to increase the thermal energy store of water. The Sun is a free energy store and non-polluting and never runs out. The initial manufacture and installation costs of fitting solar panels are high, but they are getting cheaper and the running costs are very low. One important advantage is that it easy to install on a small scale in remote areas not connected to the mains electricity supply. Lately, many people in developed countries are putting solar panels on their house roofs to generate electricity. So, in developing countries, it is a most important and convenient way of generating electricity on a local small scale in locations far from a national electricity supply. In developed countries it adds to the electricity supply (National Grid) and reduces the home owners electricity bill. Although non-polluting in itself, energy is used in making the solar panels, but, although the technology and installation is expensive, manufacture is getting cheaper and becoming more energy efficient. Once installed it is non-polluting and runs off free energy with very low maintenance costs. On average, for half the day, there is no sunlight and the sunlight itself is of variable intensity e.g. cloudy to bright sun and of course it cannot work at night - so variable output is a problem, but it is being widely exploited in very sunny countries from eg Spain to African states. Solar power is no good for a large scale electricity supply. Solar panels cannot be used to produce electricity on the same scale as large nuclear or fossil fuelled power station.